The IBM POWER7+™ processor is available at frequencies of 3.6 GHz, and 4.2 GHz. The larger IBM POWER7+ Level 3 cache provides greater bandwidth, capacity, and reliability. The 4-port 10/100/1000 Base-TX Ethernet PCI Express adapter is included in base configuration and installed in a PCIe Gen2 x4 slot. The integrated SAS/SATA controller for HDD, SSD, tape, and DVD supports built-in hardware RAID 0, 1, and 10. New IBM PowerVM® V2.2.2 features, such as 20 LPARs per core. The improved IBM Active Memory™ Expansion technology provides more usable memory than is physically installed in the system. Professionals who want to acquire a better understanding of IBM Power Systems™ products can benefit from reading this paper. 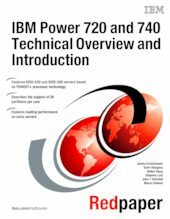 This paper expands the current set of IBM Power Systems documentation by providing a desktop reference that offers a detailed technical description of the Power 720 and Power 740 systems. This paper does not replace the latest marketing materials and configuration tools. It is intended as an additional source of information that, together with existing sources, can be used to enhance your knowledge of IBM server solutions.